In the first article of this series (September/October 2018), Elsa from the movie Frozen touched the water world and everything turned to ice and snow, sort of like Midas and his golden touch. But ice and snow are not gold for marinas. They are expensive to deal with and can cause catastrophic damage to both marina infrastructure and the boats berthed there. Frozen Part II looks at what can be done to solve or mitigate the problems posed by cold and ice. Excessive snow and ice loading on the roofs of covered slips is a problem suffered by many inland marinas. The roof systems on floating docks have very light-weight frame assemblies, minimizing the need for added buoyancy and reducing cost to the base dock system. But with enough snow load, the structural requirements change quickly. Floating docks are typically provided with enough buoyancy to support a 30 to 40 pounds/square foot vertical load, reflective of normal boater/pedestrian usage. 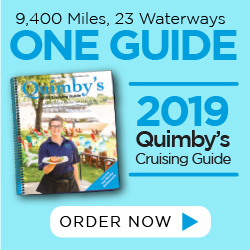 If 6 inches of snow covers the entire roof, this adds 18,000 pounds of weight over a 40-foot double slip; that weight must be carried by just 280 square feet of dockage, which represents a 64 pound/square foot load to the system. When a dock is required to support 20 to 30 pounds per square foot more than it was designed for, it sinks due to insufficient buoyancy. To keep the added weight of a roof as light as possible, dockage roof systems are designed with minimal supporting members. These slender columns have little if any resistance to off-center loading. That means if the dock is suddenly leaning a few degrees due to uneven snow accumulation on its roof, then the roof’s frame is no longer carrying the vertical load axially down its support members. If these thin members bend too far, they simply buckle and break, and the roof collapses, causing damage to the docks and to any boats moored beneath them. 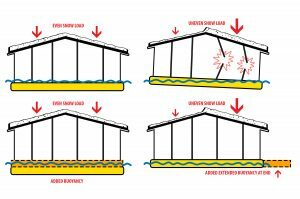 Short of the brute-force (and time-sensitive) solution of sweeping snow or removing ice from the roofs of covered docks, there are several design fixes that can be incorporated in the basis of design for the dockage. Interestingly, they all involve applying a similar solution, that is to add reserve buoyancy. It’s just a matter of how they are implemented. If the concern is purely the vertical load issue, then all that is needed is to increase the freeboard of the docks with more flotation stacked above the waterline. While this often can be enough to solve the sinking problem, it has an impact on the height of the dock relative to the deck of a moored vessel. If the resulting height is excessive and uncomfortable for boarding, then the facility might need to look for a different solution. Option 2 is to increase the width of the dockage, especially the fingers. This distributes the total load over a larger area, reducing the potential for sinking. This approach provides a marketable amenity, since boaters will really appreciate the wider walking surfaces. It also makes the docks less likely to roll or heave, delivering significant comfort and safety benefits. But Option 2 is still not the perfect solution if the snow load is uneven. Now the dock wants to tip. While any added buoyancy will help prevent the dock from tipping to some degree, it is a more expensive way to get there, and if not located optimally, may even be detrimental. For more cost-effective approaches to reduce the risk for slip roof collapse, facilities can ask the ancient Greek engineer Archimedes what to do. Archimedes is known for his famous quote, “Give me a lever long enough and a place to stand and I will move the Earth.” Well, we don’t need that long of a lever or to stand in the water to employ Archimedes’ principles to keep unevenly loaded docks from tipping. We can get that leverage simply by making the fingers a little longer than the size of the slip and extending them outward beyond the eves of the roof. The added buoyancy outside of where the snow load is acting on the roof serves as a sort of floating lever, pushing the end of the finger upward. The further out docks go to extend that buoyancy, the more offsetting impact it will have. Sometimes rather than extending the finger, all that is required is to reposition the flotation billets under the finger so that most of the buoyancy force is out at the end. In engineering jargon those are called counteracting moments, and it can be extremely beneficial to have a modern-day engineer help figure out how to put them to work. Part one of this series talked about the formation of ice. The same process that causes ice to form is the same process that can be used to prevent its growth. As they teach in martial arts training, “Use the size and momentum of the attacker against himself.” A property of ice formation is that as water temperature cools and approaches its freezing point, it becomes most dense (heaviest) around 4 degrees C, or about 39 degrees F. It is actually the least dense right at freezing. What does that mean for us and how can we use it? As water cools to 39 degrees F, the surface water sinks toward the bottom; through a process call convection, the less dense water is brought back to the surface to be cooled. At some point, the surface water is cooling faster than it can sink, allowing ice to start forming on the surface. But this also means that right below the ice is warmer water. Also, once the ice cover forms, the rate of ice growth slows, and the ice becomes its own insulator against more ice growth. That pool of warmer water right under the ice can be used as a thermal reservoir to melt the ice forming above it. A curtain of air bubbles can be generated to induce a vertical current that drags the warm water back to the surface. Equally effective is to use a mechanical flow inducer to push warmer water back up toward the surface. Either way, the ice either begins to melt or at least soften so that it no longer causes a problem in the marina. By not bonding to the piles, or easily breaking against the piles, the issue of ice jacking as described in part one is eliminated. Neither method is necessarily better than the other, and often it is the economics (cost of power) that dictates which approach to use. However, the mechanical flow option does offer the ability to focus the melting, while the bubbler is more effective for covering larger areas of ice formation and clearing. 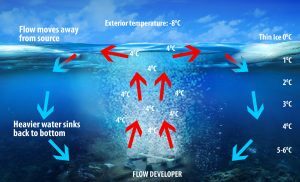 The downside of the bubbler or flow induction method is not only the cost to power the system, but also the potential that it will not be robust enough to handle the job if the ice growth is too great. Fortunately, there are some passive solutions that can be integrated into a dock’s design at the time of construction to help mitigate ice jacking of piles. Ice jacking is usually related to insufficient pile length/depth. 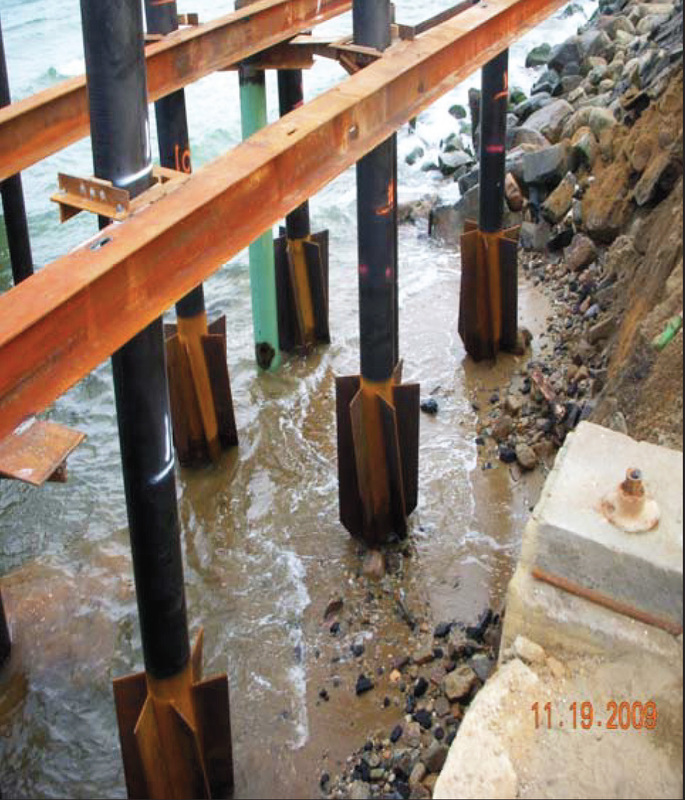 Dock piles are generally sized to support a vertical downward load. Most of the time, the vertical load resistance is defined by the bearing capacity of the soil pushing against the blunt pile tip. However, when ice starts to lift a pile upward, it is only the frictional resistance of the soil against the pile that holds it back. If the pile is short, as it likely is since the tip-bearing load capacity dictated much of its length, there is not enough soil resistance to hold the pile back against the force of the ice. The solution is to design the pile with sufficient frictional sliding resistance to prevent jacking. There are also custom pile geometries, such as Spin Fin® piles or pile accessories that can be appended to the pile to increase its pull-out resistance. The most difficult ice-based challenge for marinas is mitigating the potentially crushing impact of moving ice sheets. Engineers can try to take the brute force approach and try to build something so strong that it resists the forces and loads, or perhaps they can take the approach made famous by Captain Kirk of the Starship Enterprise (for all the Trekkies out there). So how a sci-fi adventure series has anything to do with managing massive ice loads? The answer is in the legend of the Kobayashi Maru. The Kobayashi Maru was a test concocted by the Starfleet Academy that was explicitly designed to be unpassable. It was intended to evaluate how well students could handle the stress caused by a no-win battle simulation. Convinced that his true task was to win the battle, the young Cadet Kirk hacked into the computer and changed the rules, making his opponent beatable. Similar to Kirk, redefining the problem that needs to be solved can help manage what are essentially unmanageable crushing loads. The secret is in the word “crushing.” While there is little that can be done to overcome high crushing forces, it is possible to change the mode of failure mitigation from crushing to flexure (see part one for more information on ice properties). If the ice can be made to break in flexure instead of crushing against a harbor wall or dock pile, then the forces exerted by ice drop to half or even less. This principle has been deployed for many years. Bridges that are built in rivers with ice sheet problems have piers with front faces that are sloped instead of vertical. Angular, stone pillar “icebreakers” are often installed across rivers to break the ice sheets moving past them. Even the bows of icebreaking ships are beveled to bend and snap the ice sheet in front of them. The same principle can be used effectively in marinas by introducing a conical skirt around the pile spanning the waterline. The pile diameter can then be significantly reduced due to the lower horizontal load. The slope of the inclined skirt should ideally be no steeper than 55 to 70 degrees from the horizontal, depending on the roughness of the surface material. Jack Cox is a principal coastal engineer with SmithGroup in Madison, Wisconsin. He can be reached at 608.327.4401 or at Jack.Cox@smithgroup.com.